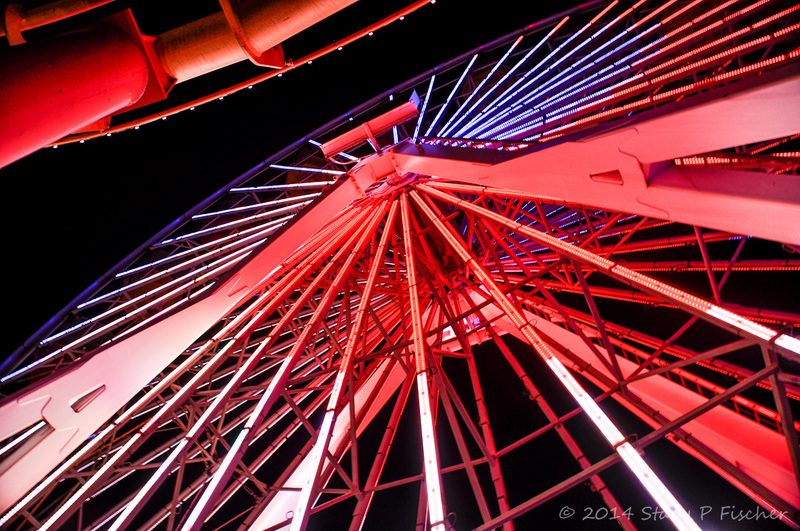 Pacific Wheel. Lens at 18mm, exposure 1/5 sec. @ f/3.5, ISO 200. Santa Monica, California boasts beautiful beaches, incredible sunsets, and the fun-filled Pacific Park amusement park on the famed Santa Monica Pier. After capturing the golden sunset over the Pier, I was excited to ride the rides AND looking forward to taking lots of photos. My goal? 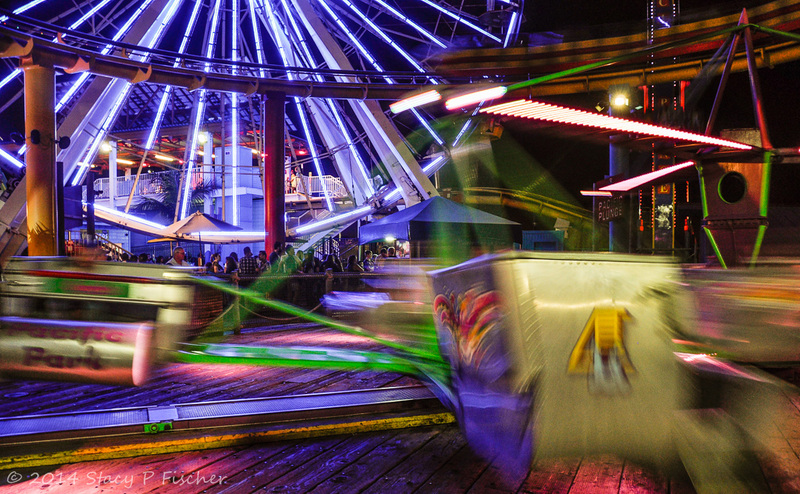 To experiment with shutter speed and try to capture the movement of the various rides. Because it was nighttime and I did not have a tripod, I had my work cut out for me. 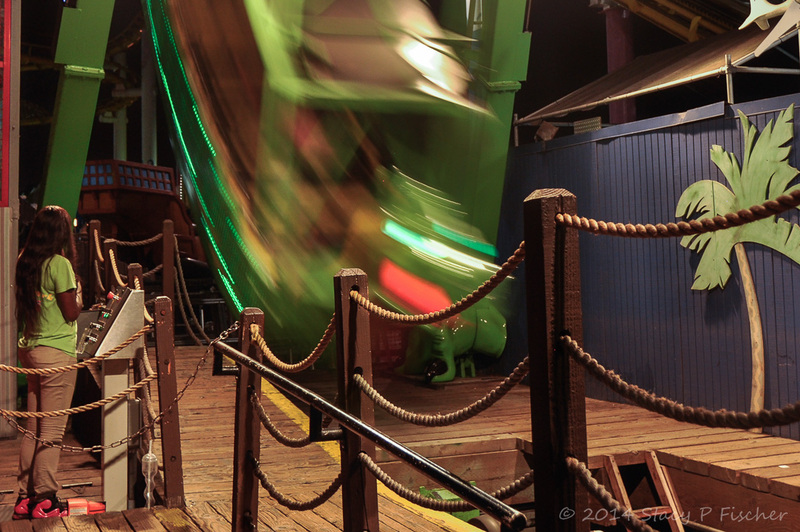 I managed to brace my camera on top of railings and planters and whatever else I could find, but with the wind off the ocean, the vibrations on the pier from the rides themselves, and a camera lens that is not very fast, camera shake was inevitable. All of these shots were taken with a Nikon D90 with an 18-200 mm f/3.5-5.6 lens. First stop? The Sea Dragon, a swinging wooden ship (sporting dragon heads at each end) that moves back and forth in a 180-degree arc. I happily stayed on terra firma while my daughter gladly climbed aboard with another single rider. Sea Dragon. Lens at 24mm, exposure 1/8 sec. @ f/3.8, ISO 400. 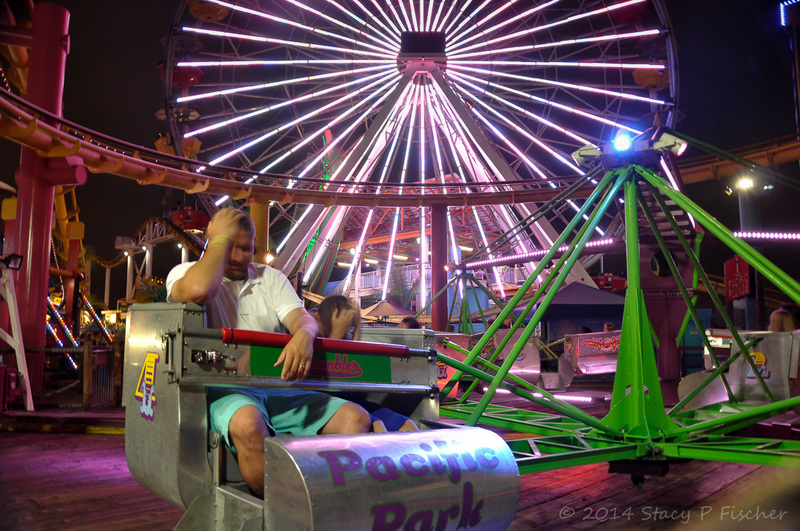 Inkie’s Scrambler was next, a swirling ride that moves and rotates at a speed of more than 11 revolutions per minute. Here, I was able to capture a dad and his son just as the ride was starting to move. Neither looks too happy about what’s coming next! The night wasn’t all about watching others test their courage – my daughter and I braved the West Coaster, billed as the only West Coast, oceanfront, steel roller coaster located on a Pier over the Pacific Coastline; the Pacific Plunge, a 150-foot tall tower ride that lifts riders up in a 5-seat gondola and drops them to the bottom; and the Pacific Wheel, the world’s only solar-powered Ferris Wheel. We also took our own turn on Inkie’s Scrambler. 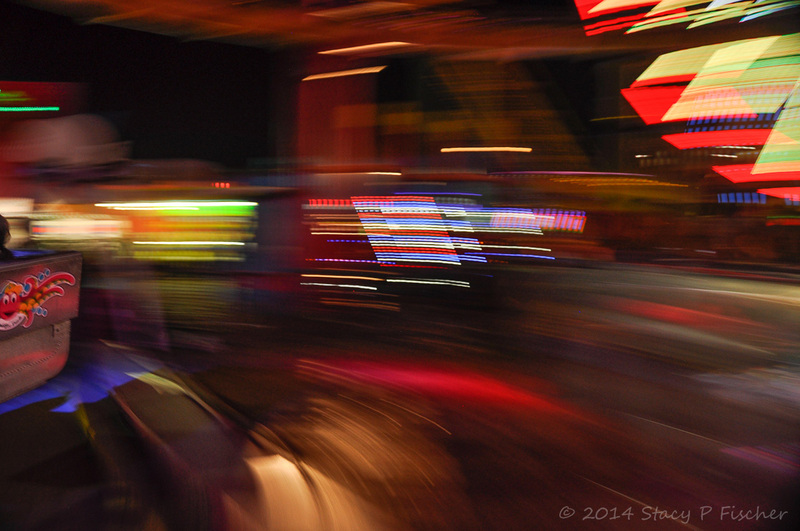 As this ride powered up, I had my camera on my lap and happily began pressing the shutter to see what I could get. The logistics were a bit iffy, given that my daughter and I were being slammed into each other. But amidst our movement and our belly laughter, I ended up with one pretty good shot. All in all, it was a great welcome to Santa Monica! Note: I submitted a B&W image of Inkie’s Scrambler to Monochrome Madness Week #23. This is a wonderful forum hosted by Leanne Cole and Laura Macky on Leanne’s blog, where each week bloggers submit their monochrome images that Leanne then puts together in a wonderful gallery. Take a look if you have the chance – as a result of MM, I’m learning a great deal about black and white photography and finding that I really like it a great deal! This entry was posted in Black & White, California, Motion and tagged black and white, Monochrome Madness, motion, photography. Bookmark the permalink. 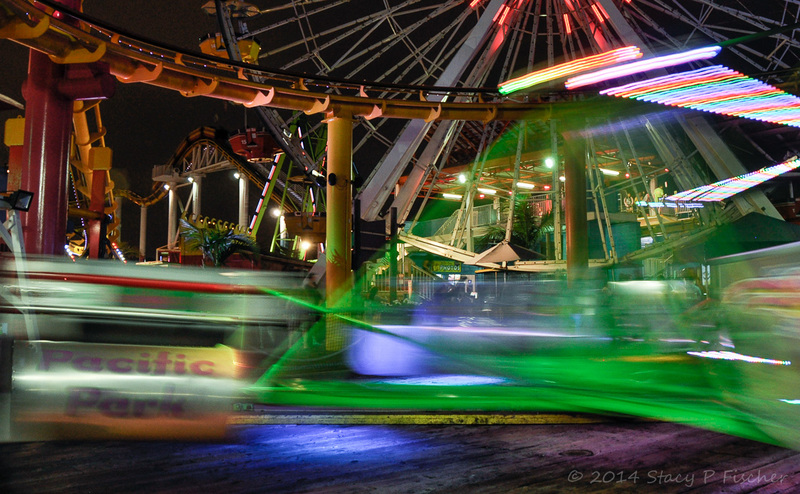 Lovely pictures, a challenge taking that lens to a theme park at night! My favourite is the first, great perspective! Thanks, Manal. It was such a lot of fun to try this out 🙂 Had I not been on a travel itinerary, I would have returned here a few more nights to keep experimenting! That’s dedication, taking your camera to a theme park! Like the results. I like best the father & son shot, in colour, because all the lights and particularly the starburst pattern behind them emphasises the “headache” post-ride. Love your interpretation of the photo – headache post-ride – brilliant 🙂 Thanks! Congratulation Stacy, these are excellent samples of good photography. Both, B&W and color photos, are wonderful images. Each one of them perfectly tells its own story. Regarding Emilio’s comment and your response about B&W photos, I dare to say that they don’t pale, it’s just that “they are dancing a ballad and the color ones are dancing a rock and roll”; so they mustn’t be in the same dance floor at the same time! (if you know what I mean). So, (respectfully) my opinion is that the wrong choice was to add static-placid-B&W photos (specially the header one) if your intent was to show movement, color, excitement, and fun. Precisely, it happened to me that when I saw that amazingly beautiful B&W photo of the wheel heading your post, I imagined that that was to be the mood of the entire post and expected to find more photos like that one. So, till I got fascinated with the amazing burst of color and motion, perfectly captured, I was someway shocked. Jaime, I love how you always seem to find a phrase that captures your thoughts in such a fun manner – ballad vs rock and roll, an incredibly apt description. Soooo, I have once again updated my post, this time with a new header image. Yes, it is the Wheel and yes it is static (as I ran out of good ones showing motion), but it’s in all its colorful glory. (Don’t know why I didn’t choose this one last night to begin with.) Hopefully the color image will work better as an intro to the piece, despite the lack of motion. That being said, I chose as the featured image the shot of the boy and his dad, so perhaps that will make up for it. In this instance, forget about that first b&w shot. Your color is tremendous. Hard to pick a favorite. I mean, the black and white is good. Maybe even great if it had it’s own venue. But paired with the rest you took that night, it pales in comparison. Sorry! I can’t imagine getting anything so sharp and clear with my Canon (I’m talking about the stationary parts of each image). Maybe I will make the switch. Did you really think you’d get anything so good? P.S. If these shots were taken this weekend we could have almost met. We were down in San Diego helping someone move. At night it was all we could do to crawl into bed, We were so sore and tired. I didn’t get one photo all weekend! Well, that would have been fun 🙂 But no, I was there the beginning of July. What good friends you are, not only helping in the move, but giving up your photography time! 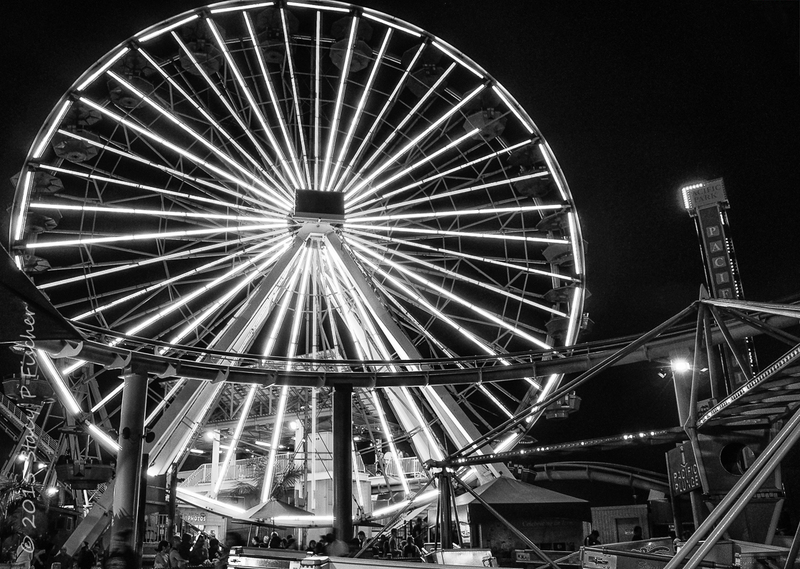 As for the b&w conversions, I chose the Ferris Wheel because I happened to capture it as the LEDs were changing, mostly to pink – it just wasn’t an inspiring shot. I could have chosen not to include it at all, but the way the post worked out, I wanted a header image and I hadn’t already included the Wheel. I like the b&w Scrambler image much better, and in fact, this post was born out of my choosing to submit it to Leanne’s Monochrome Madness. I wanted to include the other photos and not write an additional repetitive post at a later date. (Perhaps I’ll add the color version to the end of the post just for feedback to find out which one people are drawn to.). We are true photo geeks. Was there ever any doubt? Getting excited over a tripod! Hey, Emilio, I updated the post with the color photo of the dad and son, putting the b&w as part of the post script about MM. Would love to know your thoughts on which one you think works better. My thoughts? I’m honored. What the heck do I know? But this request of yours made me look at the post again and I’m still blown away by the quality of your images. I think you were correct in taking the father/son shot and converting to b&w! I lose the kid in color, he blends too much into the background. He was one of the first things I noticed in the black and white shot, how he mirrored his dad’s pose. In the color I barely notice him. So, good call! Always wonderful to “see” our work through others eyes. Enjoyed learning what caught your eye and why. Thanks so much for taking the time to go back-and-forth with me on this. I really appreciate your feedback! Great shots Stacy. 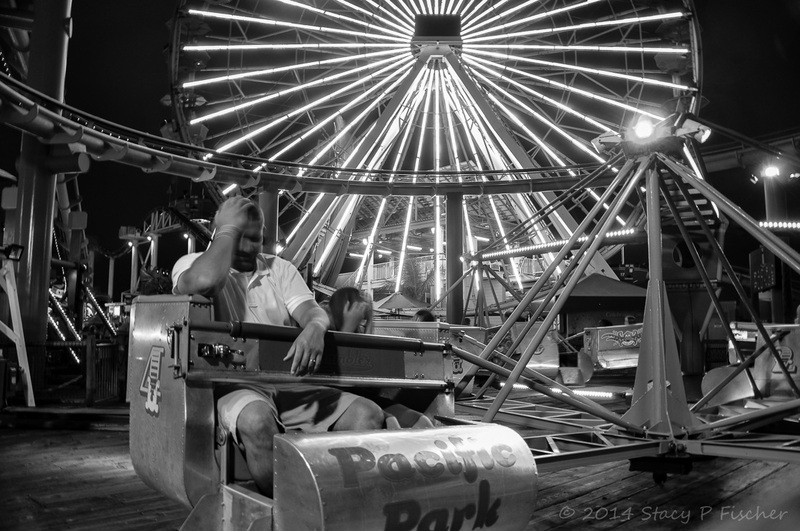 I really like your B&W of the Ferris wheel. It seems more striking in black & white and the angle really set it off. . Also love the swirling colours from the fast moving rides. Some great effects. I don’t think, for the sake of photography, I would have gone on that roller Coaster . I salute you 🙂 !! Really nice work under tough lighting conditions. Love the Sea Dragon shot and the one with the two guy’s hands on their heads.